Helen (Harris) McFarland and James Emmons McFarland, Jr.
Name: Helen (Harris) McFarland and James Emmons McFarland, Jr. 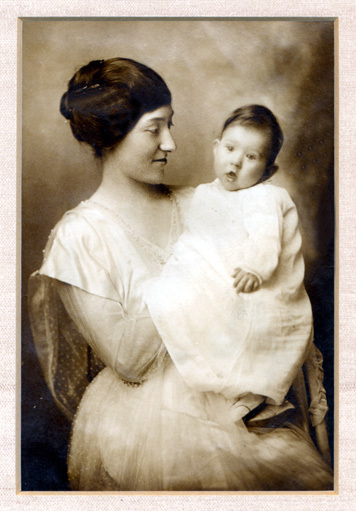 Comments: Helen (Harris) McFarland holds her son, James Emmons McFarland, Jr. Helen was the daughter of Charles Bascom Harris, Sr., and Helen (Crafton) Harris of Scottsville. In 1919, Helen married James Emmons McFarland, Sr., a Scottsville pharmacist who later owned a drugstore in Craigsville, Virginia. 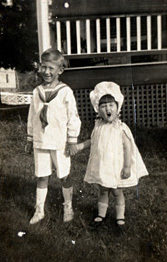 The McFarlands were the parents of two children: James Emmons, Jr., and Katherine as shown at right in a ca. 1926 photo taken in Craigsville. These photos are part of the Katherine Ellis collection. Katherine resides in Scottsville and is the daughter of Helen (Harris) McFarland and James Emmons McFarland, Sr.